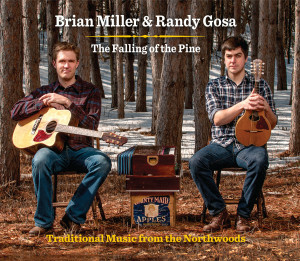 New Album “The Falling of the Pine” Out Soon! We are happy to announce that this CD will be available for purchase (both digitally and physically) by the end of July. Randy and I went in to the Hideaway Studio in Minneapolis in January with a mix of our favorite material we’ve been working on for the past two years. Building on the theme and sound of “Minnesota Lumberjack Songs,” “The Falling of the Pine” includes songs and dance tunes from North Dakota, Minnesota, Wisconsin, Michigan, and Ontario. We play guitar, bouzouki, mandolin, mandola, tenor banjo and harmonium on the recording. This CD was made possible, in part, by the voters of Minnesota through a grant from the Minnesota State Arts Board. Watch this space for ordering information!